Their profound passion and their ardent nature confer their determination. Reliable, dynamic, passionate, predominant, nifty, determined, enthusiastic, insistent, humorous, intelligent, discreet, ascetic. Labile, unconscionable, arrogant, dogmatic, self-opinionated, obsessive, compulsive, pessimistic, uncompromising, intolerant, perfectionistic, envious, jealous, inconsiderate. Persons with ascendant develop a great passion. No matter whether there are new hobbies, a new love or new personal life objectives. When interest and enthusiasm once have been aroused, nothing could stop them and prevent the realization of their ideas and dreams. Therefore Ascendant Scorpio shows considerable insistence. They cling to their initial concept and would not like to change their mind by other person’s advice or ancillary agreements. They do not listen to that or follow such advice. Almost this could give the impression of being compulsive and obsessed to get the yearned result finally. Deferring own requirements to be succeeded in getting better conditions. Ascendant Scorpio is idealistic and pedantic. So it will not be easy to realize their objects and ideas in life. Forced by high demands, there is no room for failure – when it would occur there will no satisfying solution being accepted. If there is no way out of their disaster they blame and express accusation. Notorious enthusiasm is changing to profound self-doubt. Every single defeat reveals shame. 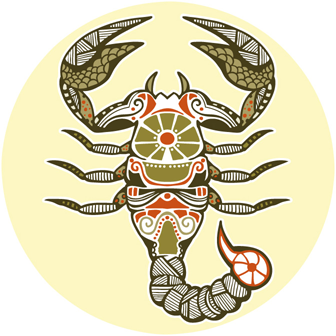 About profession and career, Ascendant Scorpio is keen to experiment and likes to get to the bottom of things. They tend to go deeper into the matter than simply believing in looking for adventure by finding out the spirit and limits. Referring to love and relationship, they are more reliable and trusting in a constant process. Descendant Taurus represents the counterpart of Ascendant Scorpio. In their course of life, persons with ascendant Scorpio must learn to be more patient and to develop calmness. In the case of failure, they have to recognize to see no total breakdown - just that one plan or idea would not have been succeeding. Supplemented by these attributes of calmness and patience they will find their way much better than before. Their point of view is much more a far-sighted advisor.